I’m no longer as green as I used to be but the wine still is! "Oh!" I said, somewhat chastened. 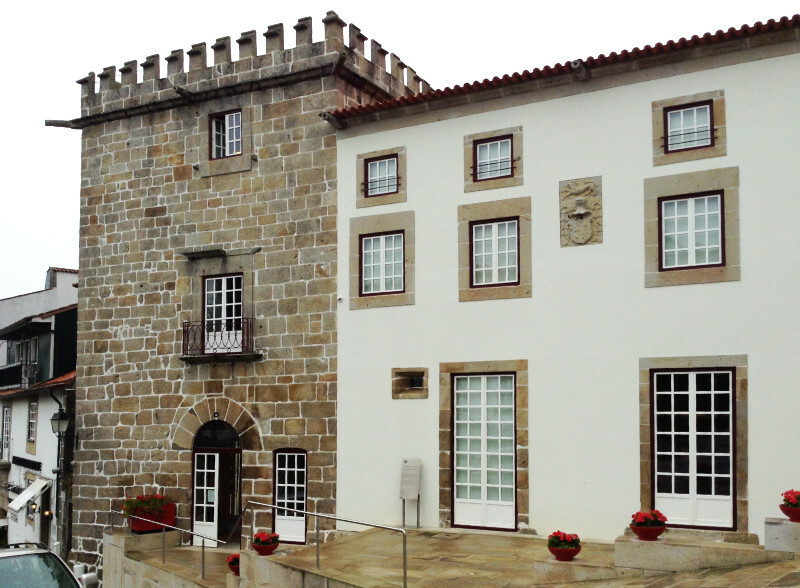 'Museum' had been the word Engenheiro Pedro had used when he told me about the new Vinho Verde Centre in Ponte de Lima and there didn't seem to be a sign outside with an alternative name so it wasn't altogether my fault that I'd got it wrong. "It's a 'Centro de Interpretação e Promoção do Vinho Verde'." To find out exactly what that means and what was going on in the stone tower just down the road from the the Câmara Municipal – the Town Council offices – click here. I imagine you can guess what all those words mean. It is literally a Centre to Interpret and Promote Vinho Verde. (Verde here doesn't mean green in colour but young as the wine is consumed soon after bottling.) You might think that what we're talking about is an information centre. Well, it is certainly that but there's a lot more to it than a receptionist who answers questions and hands out leaflets. 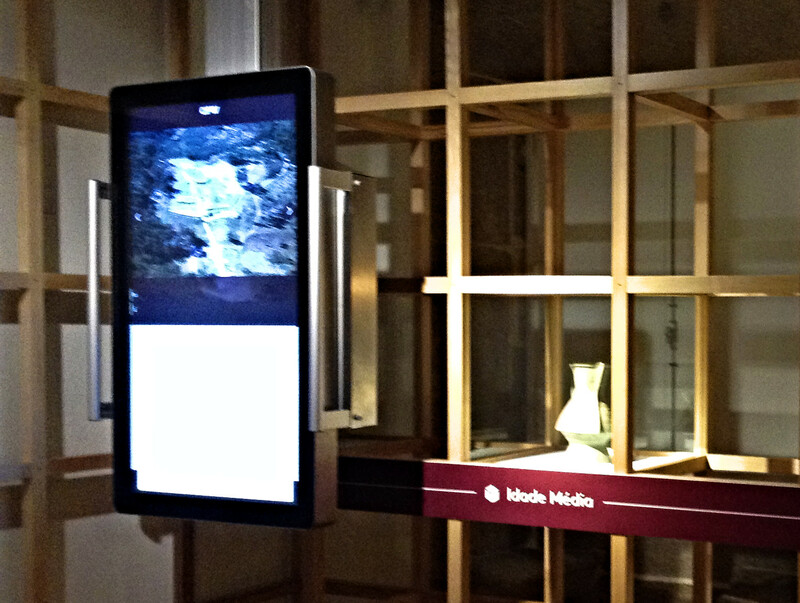 A visit here – and it's a great way to spend a couple of hours on a wet afternoon, as we did - is a complete experience with interactive technology, an exhibition of traditional artefacts, a film and a tasting session. Centres of 'interpretação' are something the Portuguese do rather well and this one is no exception, though I'm tempted to think they have gone a bit overboard with the technology. The screen you can see in this picture slides along a timeline from pre-history, through the Middle Ages, to the modern day. At each stage the touch screen shows maps and pictures appropriate to each epoch. There's lots of interesting information but, if you have the misfortune to come in after someone has started an exploration of what is on offer, you have either to watch with them, going at their pace and following their choices, or wait till they have finished. We were alone in the centre so we didn't have to queue but what about on a busy day in summer? Once you have some history and the background to the production of vinho verde, you can go upstairs to a room with attractively laid out tableaux of the different stages of wine making and the equipment used. Here we have a collection baskets and the ladders to reach high clusters of grapes. In the Minho many small holdings have vines trained up granite posts and along wires around the edges of their land, thus freeing up the centre space for other crops. There are examples of barrels for transporting them and a mechanical grape crusher. I hope you aren't disappointed that most people haven't trodden the grapes for ages; a grape crusher is much quicker and less labour intensive. After the wine is made, it is left in barrels to mature. How do you move those heavy wooden barrels about? You use a simple two-wheeled cart with stakes to stop the barrel from rolling. The traditional motive power up in the north has always been the Minhoto ox which, perhaps because it was such an important member of the household, was tethered to the cart by an elaborately carved yoke, one of which can be seen hanging on the rear wall. Today, of course, everything is more sophisticated, especially as the wine is made not just for family consumption but for sale, so testing equipment is required. Further up the tower, in the top room, is a display, including this mini stone representation of a bull and his handlers, and film about the festival of the Vaca das Cordas, which takes place on the eve of Corpus Christi. You can read about that in a previous post: The Vaca das Cordas; a cow and bull story from Ponte de Lima, http://www.me-n-youinportugal.com/index.php?blog&nid=31. This was a pagan festival which was adopted by the Catholic church, as so many were – why upset your actual or potential converts by taking away their fun? Of course, integral to many pagan festivals was the consumption of alcohol and the Vaca das Cordas is no exception. In some videos, individuals can be seen clinging to the stonework near the parish church door and pouring a libation over the bull's head but most of the wine and beer is consumed by the locals with stalls set up all around the town. Delightfully, the Portuguese do not get aggressive after consuming alcohol as they do in more northerly European countries, notably my own. Portugal is a family oriented country and people are out with their partners, children, in-laws and grandparents so good behaviour is normal and only a token presence of the police is ever needed at Ponte de Lima festivals. The final stages of this visit involve a film about the different areas of vinho verde production - this can be in Portuguese, English or a number of other languages, just ask at the desk for foreign language versions - and a tasting session. I have diabetes so my alcohol intake is negligible but I made an exception on this occasion. I wish I could drink more because I really love vinho verde and it isn't expensive. The top price at this centre was for a local Ponte de Lima wine at € 5 a bottle but many more versions can be found more cheaply in supermarkets. 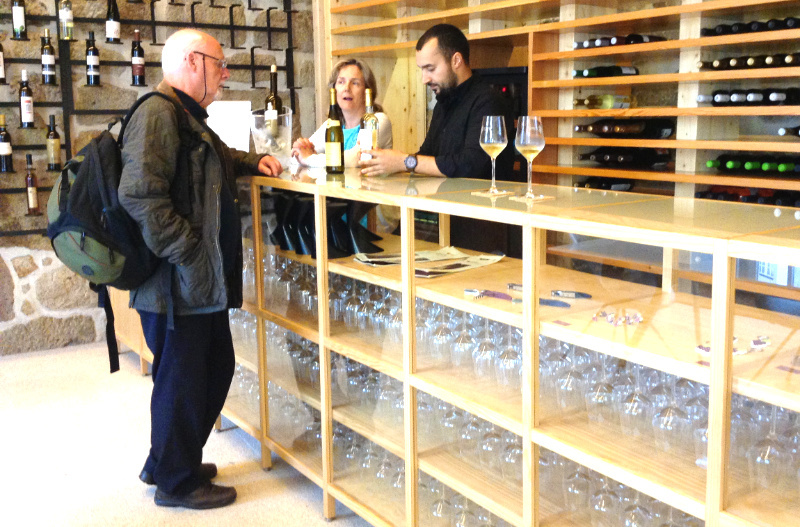 So, come to Ponte de Lima, find out all about Vinho Verde in the 'interpretation centre' and then enjoy a delicious chilled bottle of wine with your dinner and perhaps take a case home with you to remind you of happy, sunny days in Portugal. Can't wait to take you there! That sounds interesting, Margaret. I've become increasingly fond of vinho verde (the whites, not the reds) since moving to Portugal and they've actually been my gateway back to whites in general. I must take a look at the interpretation centre next time I'm in Ponte de Lima. Hi Julie, I'm glad you like the cool, refreshing, slightly sparkling taste - and the alcohol level tends to be quite low 9 or 10% so you can drink without having to worry about wobbling around the place afterwards. If you drink for pleasure rather than inebriation, it's just perfect. I love vinho verde and wish I could drink it but I do have to be so careful about sugar and alcohol now.